The Story of Adam and Eve. Genesis, the first book of the Bible, contains two accounts of how Adam and Eve came into being. The first version, which most likely dates from between 600 and 400 B . C ., says that God created all living things—including a man and woman "in his own image"—on the sixth day of creation. According to the second version, which is longer and probably several centuries older, God (here named Yahweh) made Adam from dust and breathed "the breath of life" into his nostrils. God then created animals so that Adam would not be alone. However, God saw that Adam needed a human partner, so he put Adam to sleep, took a rib from his side, and created Eve from it. Adam and Eve lived in a garden called Eden, from which four rivers flowed out into the world. Like other earthly paradises in mythologies of the arid Near East, Eden was a well-watered, fertile place that satisfied all of the needs of Adam and Eve. God imposed only one restriction on life in this paradise: not to eat the fruit of a certain tree—the tree of the knowledge of good and evil. A sly serpent in the garden persuaded Eve to eat the forbidden fruit, and Adam tasted the fruit as well. The two lost their innocence immediately. Ashamed of their nakedness, they covered themselves with leaves. God saw that they had disobeyed him and drove them from the Garden of Eden. When Adam and Eve left Eden, human history began. The two worked long and hard to wrest a living from the earth. Eventually, they grew old and died, but not before they had borne children. The first two were their sons, Cain and Abel. According to Jewish, Christian, and Islamic tradition, all the people of the world are descended from the sons and daughters of Adam and Eve. Christian Interpretations. The Jewish, Christian, and Islamic traditions each have their own versions of the story of Adam and Eve as well as their own interpretations of its meaning. In Christian thought and belief, three important aspects of the story are the serpent, the Fall, and the doctrine of original sin. The image of God fashioning Eve out of Adam's rib may have originated in an ancient legend from Mesopotamia *. After the god Enki ate eight plants belonging to the goddess Ninhursag, she cursed him so that eight parts of his body became diseased. When he was nearly dead, the gods persuaded Ninhursag to help him, and she created eight healing goddesses. The goddess who cured Enki's rib was Ninti, whose name meant "lady of the rib" or "lady of life." In Hebrew mythology, Adam names the woman created from his rib Hawwah, which means "life." The Mesopotamian story probably influenced the Hebrew one, which became the basis for one biblical version of Eve's creation. The serpent was identified with Satan, God's great opponent and the force behind all evil. The importance of the serpent is that, although Adam and Eve were weak and gave in to temptation, they did not sin entirely on their own; Satan encouraged them to do so. The Fall refers to the expulsion of Adam and Eve from the Garden of Eden into the world of ordinary, imperfect human life (sometimes called the fallen world). Some people interpret the Fall to mean that in the original state of existence before the beginning of history, people lived in harmony with each other, God, and the natural world. Closely related to the idea of the Fall is the doctrine of original sin. This idea came from the writings of the apostle St. Paul, whose work appears in the New Testament of the Bible, and of later Christian thinkers whom he influenced. According to this doctrine—which not all branches of Christianity accept—the sin that Adam and Eve committed when they ate the forbidden fruit marks every human being descended from them. As a result, no one is born completely innocent and free from sin. 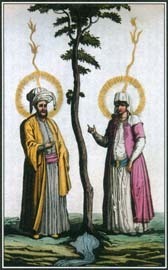 Islamic tradition includes a tale about Adam and Eve that is similar to the version in the Bible. This Islamic work of the 1800s shows Adam and Eve standing next to the Tree of Knowledge. Art and Literature. During the many centuries when European art dealt mostly with religious ideas, the story of Adam and Eve was a favorite subject. Among the famous images of the couple are the paintings in the Sistine Chapel in Rome by Italian artist Michelangelo. Completed in the early 1500s, they show the creation of Adam and Eve and the Fall. Another well-known painting of Adam and Eve comes from German artist Albrecht Dürer and was done in 1507. Artists of all periods have used fruit and snakes as symbols of temptation and evil. See also Creation Stories ; Eden, Garden of ; Fruit in Mythology ; Lilith ; Semitic Mythology ; Serpents and Snakes . Does man actually have one rib missing or is that a myth? Your site said: "The Mesopotamian story probably influenced the Hebrew one, which became the basis for one biblical version of Eve's creation." First of all, do you have hard evidence that the biblical account is a myth? I believe not. Secondly, even if there is some weak evidence, this would be no reason for an assumption. Your confidence in your assumption is proven by your use of the word "probably" which shows a bias (maybe anti-religious) on your part. There is no basis for you to assume that anything in the Bible is a myth. In fact, the biblical account could have been the influence for the Mesopotamian story. John Parsons said: "Does man actually have one rib missing or is that a myth?" This is irrelevant. Taking a rib from man and making a woman would not mean that man had one less rib than the woman. The woman could be formed with any number of ribs or the same number of ribs as the man. This reminds me of the Noah story that was copied from the ancient Mesopotamians. The Epic of Gilgamesh (12 Volume Set), and the other one (forget the name) that is a predecessor to both of those as well. What would King Nimrod do? Ok, For a religion to be true, in my opinion, it would have been always, that is ALWAYS true. Since the beginning, and in all history. What about the Norse religion, the Greek gods, and the uncounted "True" religions that came before? I am not saying that these or others are true, but simply others that thought that they were "The One". This is not an attack, just an observation. Why didn't God give the correct religion since creation? Mark Twain: "When you find that you are on the side of the majority, it is time to pause and reflect." I was told when I was having alot of back sug and neck surg. I have 2 ribs not like other women have. What does that mean..I was told that by my surgeon. Answer to 1: NO, we have the same number of ribs on both sides. Answer to 2: You are shifting the burden of proof, therefore you fail. I like this article. i read this website all the time., i learn a lot from this. Whatever the origins Adam and Eve has all the elements of a myth.